Sans Mots – no words! When the everyday life is characterized by one’s family as well as being a creative and artistically involved, many impressions merge on a daily basis. Therefore, it can be an easy task to run out of words from time to time. This is how Alexandra Lehmler feels like: She is on the one side, a successful artist, on the other side, a loving mother. Being the mother of three kids, she has never lost the urge to develop herself as a musician and realize her full potential. Two full-time jobs do not stop the saxophonist from Mannheim to handle her tasks with charm. “There are many parallels, rather it is a ravaged child’s room or a messy final rehearsal before a big gig. You are constantly surrounded by stress, but you will also be rewarded in return. You just have to balance it out and find the good in the bad”, describes Lehmler her daily life. 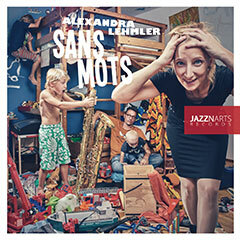 As a result of her creativity, her meanwhile 5th album – Sans Mots – will be released on February 24th 2017 on the Mannheim based label JAZZNARTS RECORDS. For this album, she gained her inspiration from several artists. Lehmler had the chance to experience Franck Tortiller, Patrice Héral, and Herbert Joos during a live concert of the Orchestre National de Jazz in Paris. She immediately engaged them for another concert. “For a long time, I wanted to make music with Patrice, Franck, and Herbert. For my new album this wish came true. Even during the rehearsals, there was a magical vibe going on, and we were all amazed by the final result.” The French vibraphonist Franck Tortiller is, same as the percussionist Patrice Héral, widely known across his country’s borders, for example as the director of the Orchestre National de Jazz. Herbert Joos on the trumpet is a special guest. Since over 50 years, Joos has had a great impact on the international Jazz scene and will be awarded this year for his musical lifetime achievement by the German state of Baden-Württemberg. He is definitely at the forefront of European Jazz composers. Matthias Debus complements the quintet on the bass. He is one of the most active musicians within the Rhine-Neckar-Delta and also Lehmler’s husband. Many pieces on Sans Mots are written by the bassist. The first track Waltz For Carlo is a musical portrait of Lehmler’s son. Similar to Choral, this track is a deeply moving, emotional, and contemplative perception of life. Voisins Imaginaires narrates an everyday situation, in which curious neighbors are watching the exceptional hustle in Lehmler’s home. Farewell, pain, grief, and the loss of something loved, are the strongest emotions of human beings. Tränenmeer deals with these emotions by also showing how amazing a fresh start can be. The phase of starting something new is expressed on Feeling Round through the art of straightening. A nightmarish situation is solved in order to make life feel “round” again. But not only is this album about the future, it also deals with memories of the past. Monument stands as a symbol for the gap between the cheering and the disregarding of old times. These can often be Un Souvenir Sans Souvenirs, a souvenir without memories. A song like a poem, but without words – Poème Sans Mots. Mo is the end of the album; an homage and memoire toward a formerly band companion and friend of Matthias Debus, who had to suffer a hard fate. Sans Mots is a musical homage to Lehmler’s children, her family, the scurrility of the daily life, the daily madness, life, and love. Alexandra Lehmler and her musical companions shine on their instruments and create fabulous pictures and stories in the minds of the listeners. Consistent from the first to the last note, even without words.